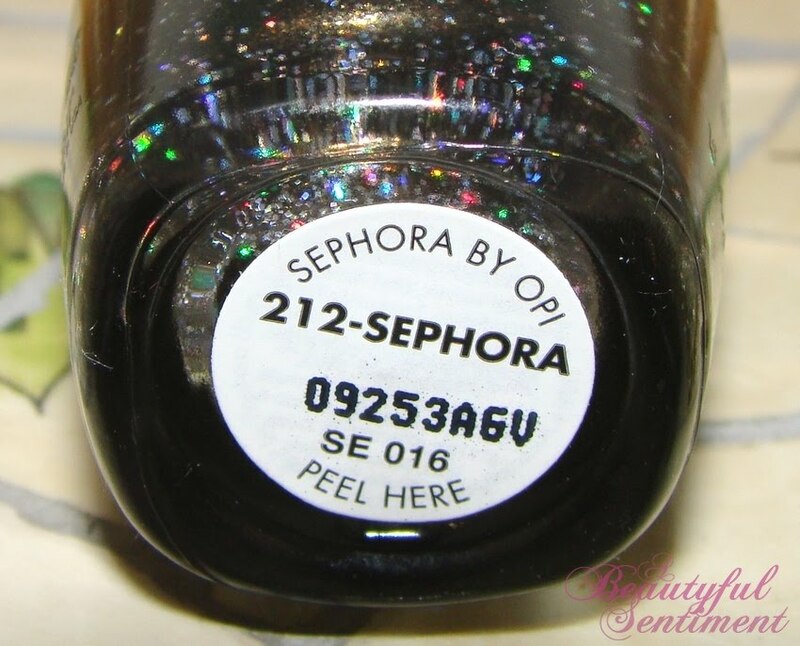 SEPHORA by OPI’s Nail Colour in 212-Sephora ($9) is a limited-edition shade that was launched for the opening of the latest Sephora Times Square location a few months back. 212 sold out quickly and was slow to come back in stock, but now that it’s back I had to get a bottle for myself. It’s a smoky black polish base with a myriad of iridescent gold, copper and other shimmery bits that’s opaque in two coats – be forewarned that this is one glittery polish! A lot of you have been asking me what polish I was wearing in my first two YouTube videos (thank you so so much to everyone for checking them out and subscribing! ), and this is it. 212 was my polish of choice for Halloween as the chunkier coppery/orange looking shimmery bits are nice and festive and definitely holiday-appropriate. 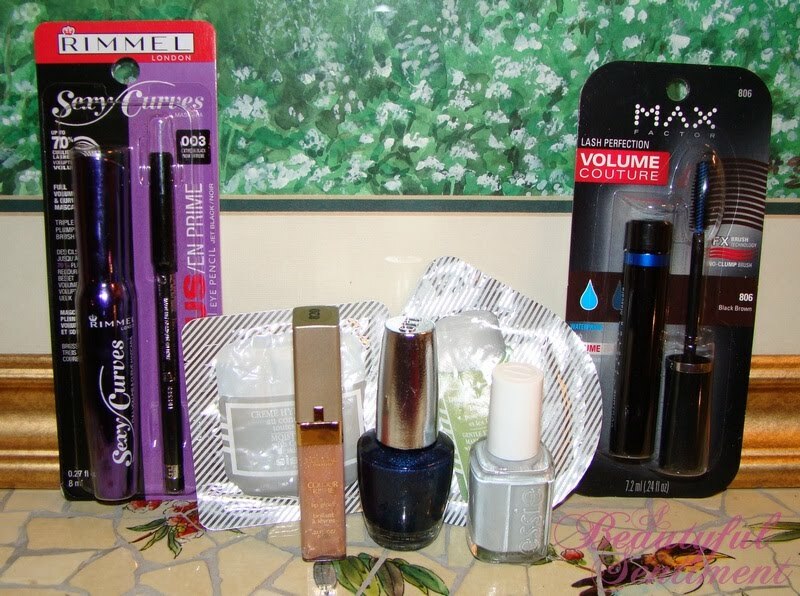 Check out my nail photos and the rest of the review after the jump! One thing that I do feel needs to be mentioned is that 212 Sephora tends to look a little green under certain liking conditions. It’s not unattractive, just a little weird. The finish isn’t completely smooth due to all the glitter – it’s a little lumpy and chunky feeling, and definitely a major ordeal to remove, but all in all I’m kind of loving it. It’s no OPI DS polish (really need more of these!) but constantly find myself admiring all the shimmer (there’s much more than you see in the photos – darn flash!) so it must be pretty nice, right? I purchased this product myself. 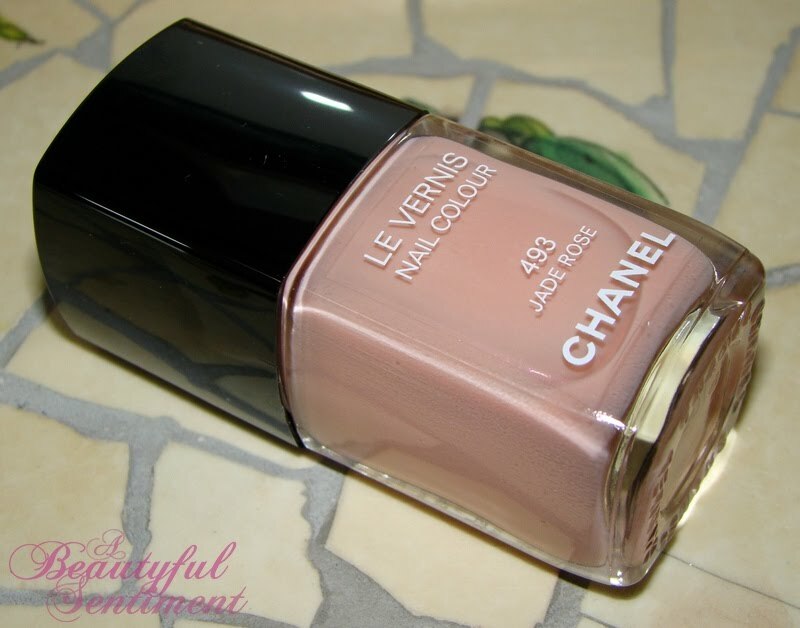 A fellow blogger, Charm Candy, introduced me to the shade and I spent weeks hunting it down. Needless to say I was ecstatic to learn it was back in stock! 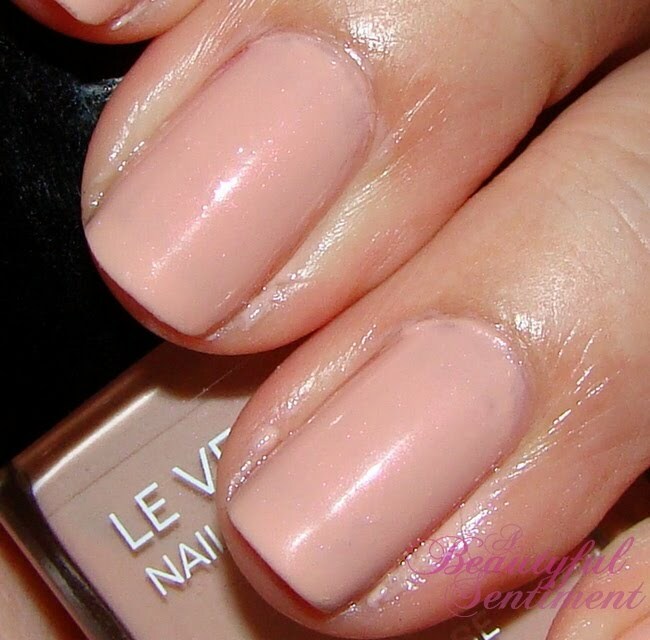 Matte nails have been all the rage this year and while I happen to love the look, I’ve been hesitant to purchase matte polishes as I already own a lot of polishes I like, and of course I worry that I’ll be over matte polishes long before I’ll have made any decent progress on my bottles of polish. 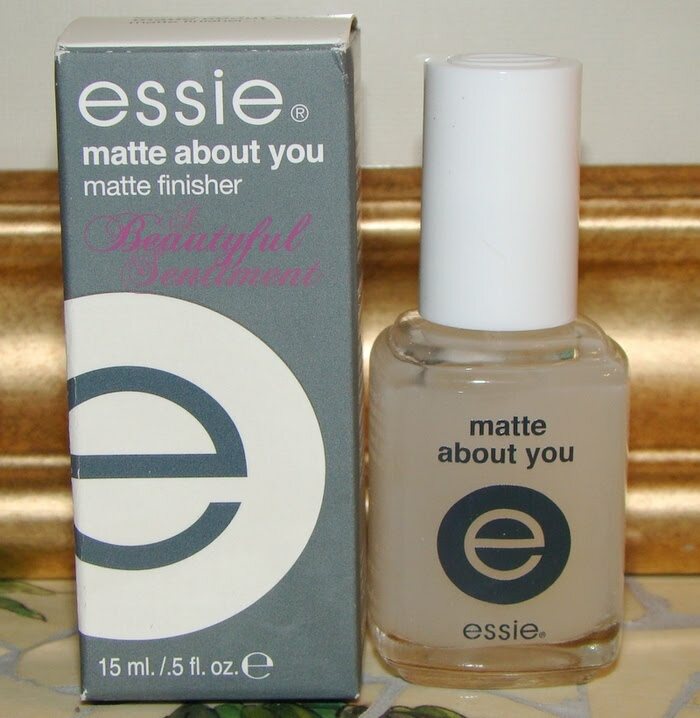 Nicole was sweet enough to send me this bottle of Essie’s Matte About You and it’s really been the perfect solution to my dilemma ~ it enable me to mattify any polish that I already own, obviating the need for additional polish purchases! OPI DS Fantasy before Matte About You. Check out the AFTER shot and the rest of the review after the jump! So honestly OPI DS wasn’t my favorite mattified look, but I’ve been using this for months with a million different polishes and it works just beautifully, transforming my polishes from shiny and glossy to creamy smooth satiny matte finishes. 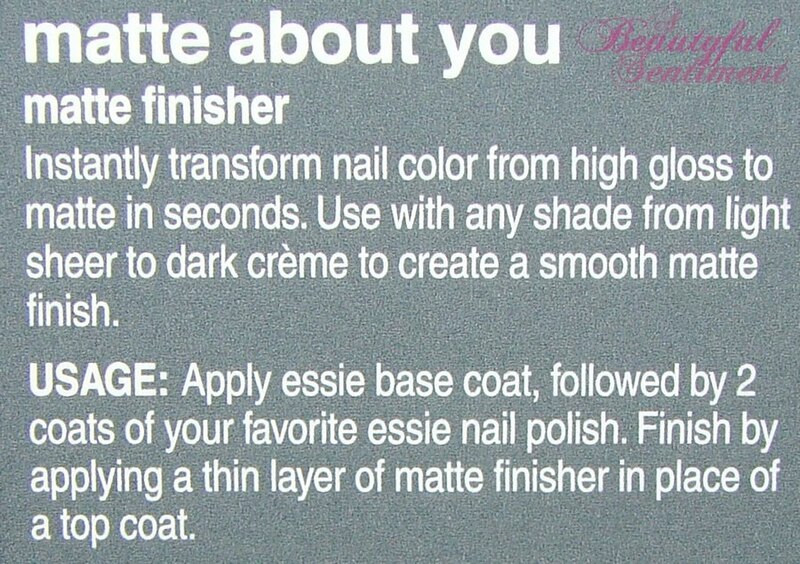 One thing about applying a matte top coat is that when the matte top coat starts to fade, your nails will start to look glossy once again. 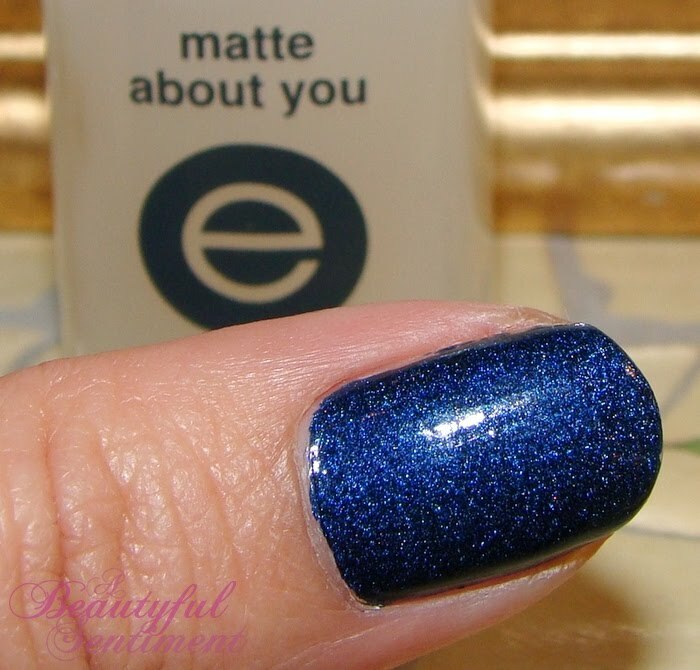 I also had a lot of issue with my polish starting to flake (literally) a day or two after using this stuff, so I had to resort to applying my polish, then a layer of my usual top coat, then matte about you on top of that for long-lasting color. 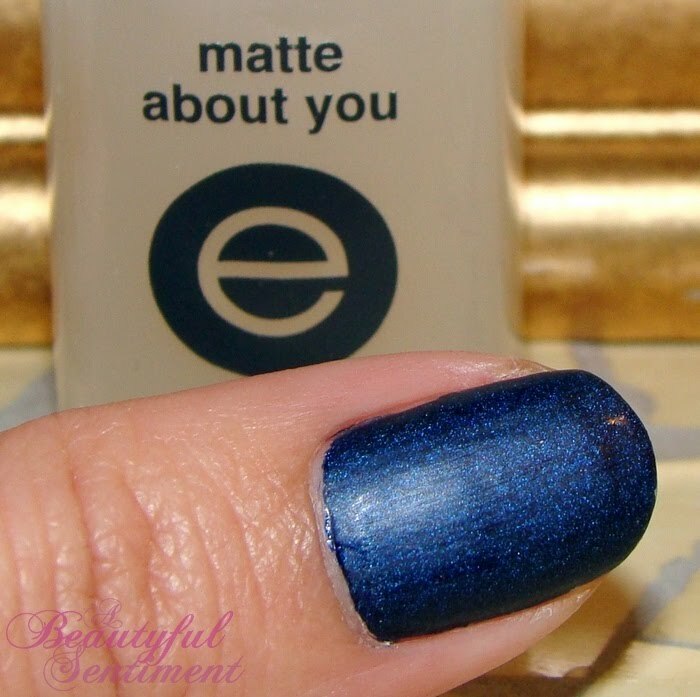 Overall it’s a great option to have, and while it does necessitate a little effort, I happen to love my Matte About You! The Designer Series by OPI is a line of nail lacquers with a state-of-the-art formula that combines dazzling diamond dust with saturated pigments to give you a nail color that explodes with brilliant almost holographic shimmer. 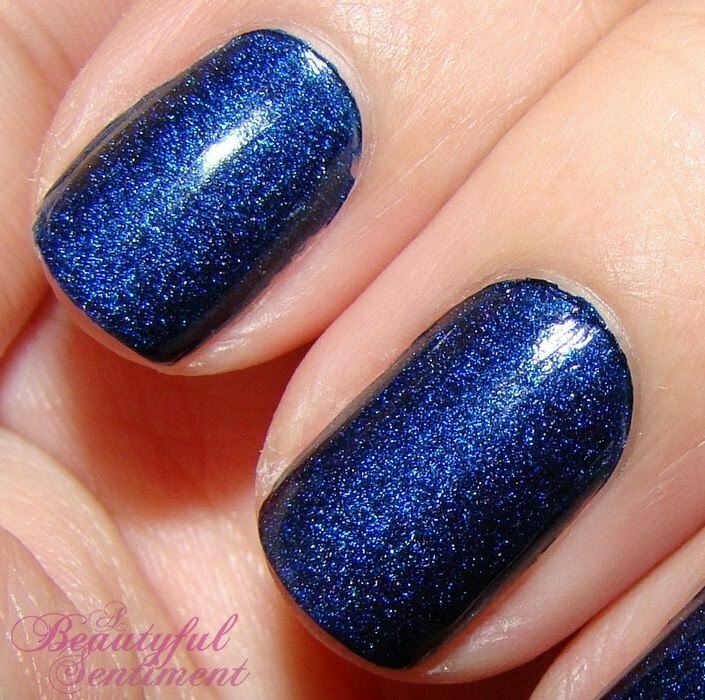 Shade DS Fantasy is a deep, midnight blue base that contains a ton of magical silvery blue shimmer that gives your tips the illusion of a starry night sky. 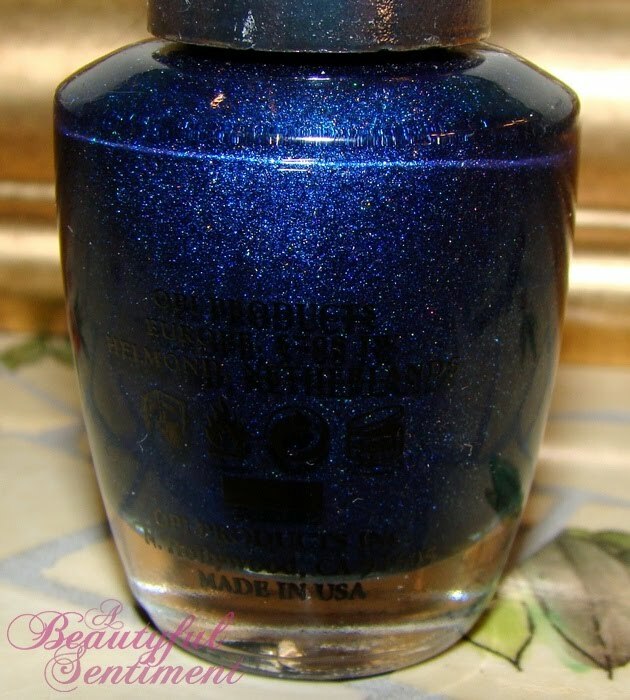 The shimmer is awe-inspiringly beautiful and really is a must see on nails. See DS Fantasy on my nails after the jump-it’s not to be missed! I’ve been wanting to try the OPI DS polishes for the longest time but I haven’t been able to find them near me. However a sweet individual was wonderful enough to send me a package including this polish and a bunch of other fun goodies for me to play with. These DS polishes are dangerous though – definitely the type of product where once you’ve tried it, you can’t stop at just one! Thanks so much for the package Mariza I really loved everything! More stunning close-up shots courtesy of Charm Candy aka Tori, this time of MAC’s Baby Goth Girl Nail Lacquer from their Style Black collection ~ you asked for nail swatches, she delivered, how great is she? Baby Goth Girl is a black polish with lots of pinkish purple shimmer – according to Tori it’s hard to capture on camera but I think she did an amazing job. After having seen her photos I’m dying to get my hands on a bottle! And since purple is currently my “it” color, Tori was kind enough to send me a few shots of some gorgeous purple polishes. Check out some close-ups (and one seriously cool holographic polish) after the jump! 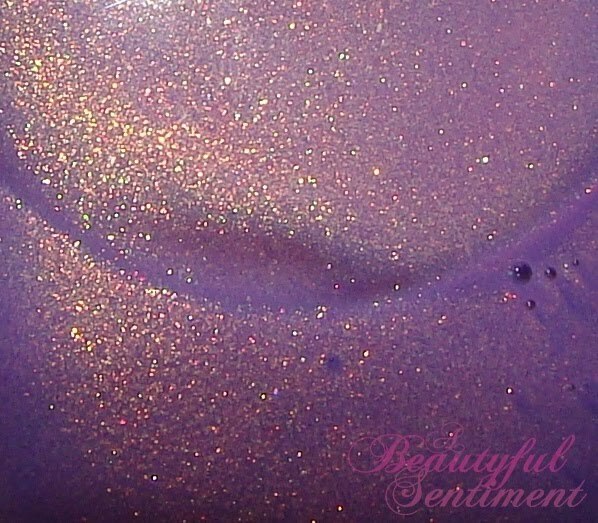 I’d actually been meaning to purchase this gorgeous purpley lavender holographic polish for the longest time but had never quite gotten around to it, but Tori’s photo lit the fire under me and I finally placed my order! I picked up a few other holographic polishes so be on the lookout for that post – my package is slated to arrive today. 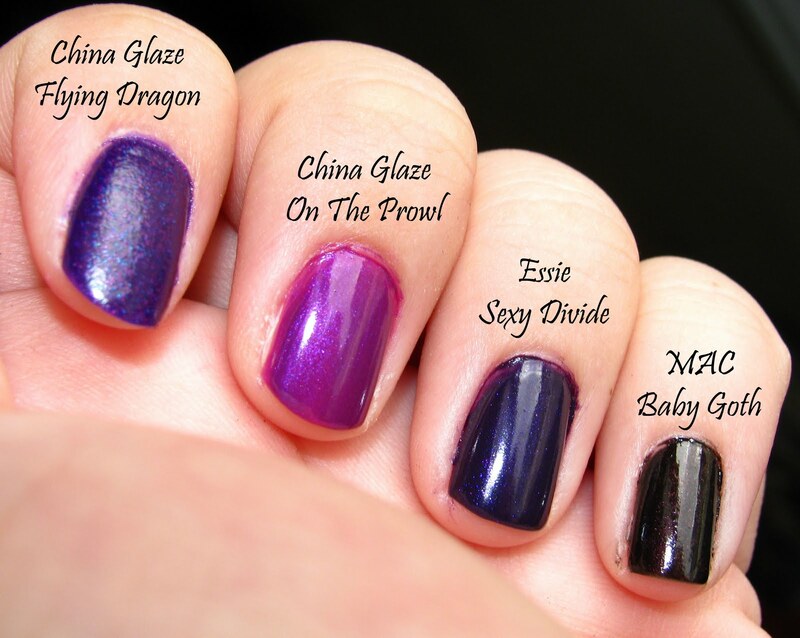 I’ve heard that China Glaze’s holographic polishes look AMAZING coupled with the Konad. 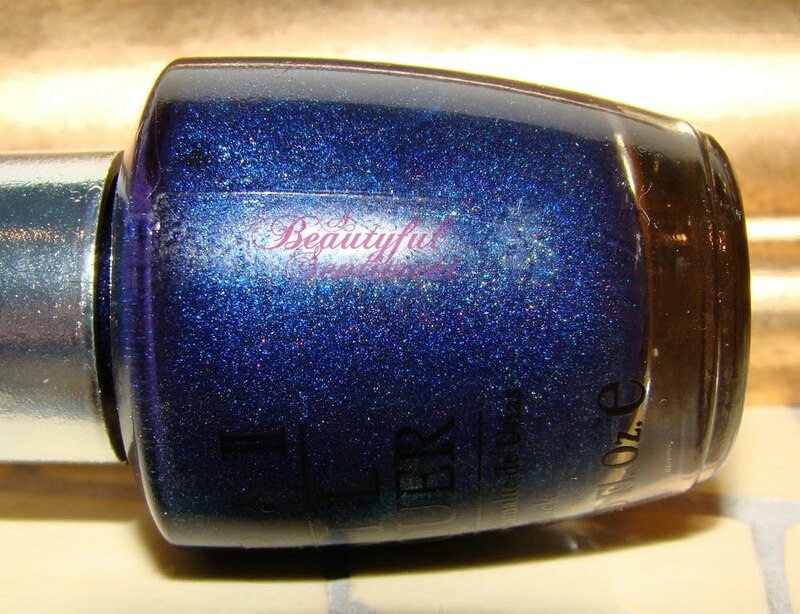 I love that Tantalize Me seems to have a slight duochrome blue sheen to it, at least in the photo. Definitely a nice almost-but-not-quite-pink option for my pink-loving self! I know you’ve seen about a million variations on this Konadicure using Sally Hansen’s Insta-Dri Polish in Whirlwind White as a base with my Konad m60 plate, but I swear this one actually looked quite different in person! 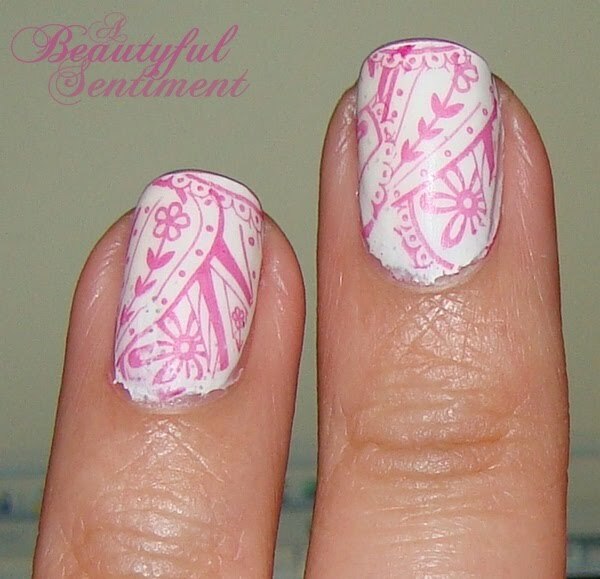 The overlaid pattern was created using OPI’s Ate Berries In The Canaries, and then I topped it all off with a coat of Essie’s Matte About You to eliminate the shine and create a satiny finish. I’m by no means a manicurist and I know the edges/cuticles look horribly messy, but bear with me! I thought that this was actually quite beautiful in person, and the matteness definitely lent a new element to the whole look. 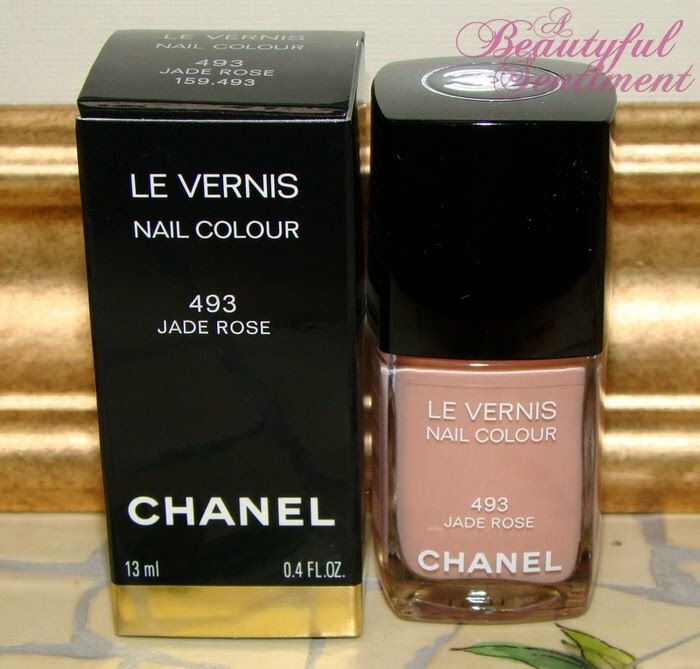 I don’t plan to be wearing thi smuch longer though – tomorrow I’m whipping out Chanel’s hot new Le Vernis Nail Colour in Jade Rose, which I predict will be insanely popular in the coming weeks! I also attempted to mattify Zoya’s Zara polish, and while it definitely did look somewhat satiny/matte in person, it definitely wasn’t as matte as I had expected thanks to the multitude of golden shimmer this polish contains. 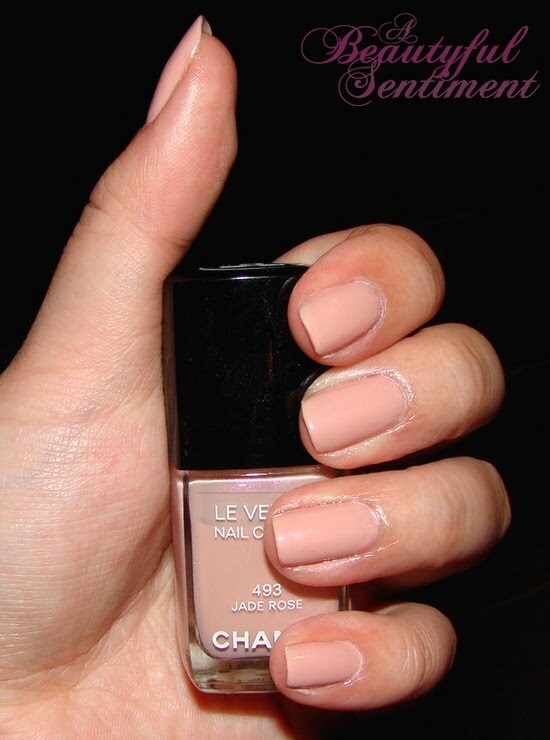 The matte top coat created more of a semi-opaque glaze atop the polish, muting it. Still pretty though! What nail colors have you been experimenting with lately? A Package-Ful Weekend & My First Matte NOTD! I’m a very lucky blogger to have so many wonderful readers that I consider to be friends, and this past weekend I received two wonderful packages that simply made my weekend! Charm Candy (who runs a lovely blog on Juicy Couture Charms) sent me this ridiculously cute (and yummy smelling) package full of goodies from this little Hawaiian company called Berry Sweet Bath & Body. The mango butter lip balms seriously glide on like butter and there was this one pineapple lip scrub in the package that smelled so good I almost ate it! 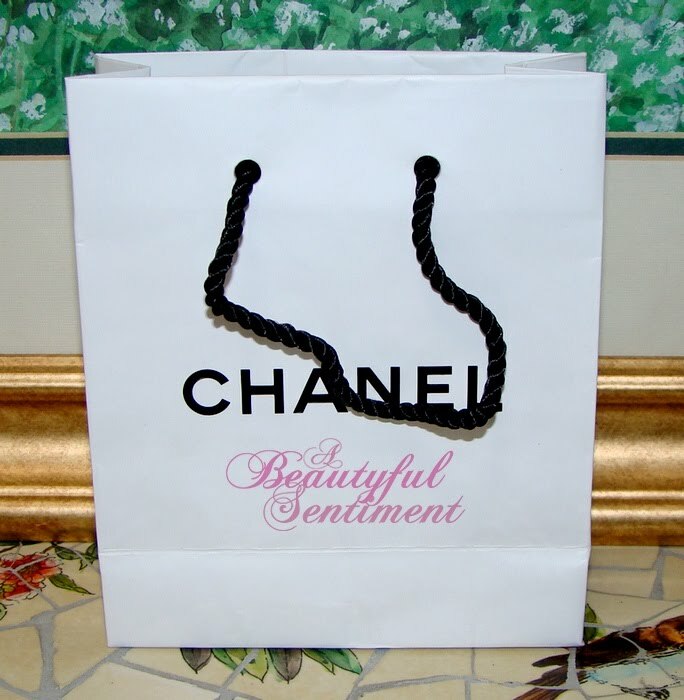 I’ll be reviewing everything for you soon, so stay tuned for more detailed photos! Just as a teaser, the lip balms have scrumptious-sounding names like Lemon Cupcake, Mojito, Gummi Bears, Raspberry Lemonade and Strawberry Candy. 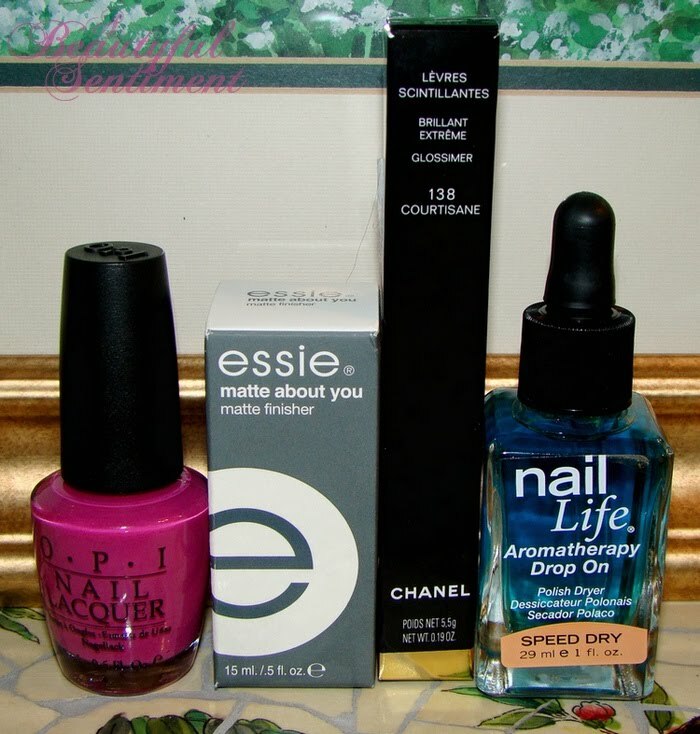 And the always lovely and wonderful Nicole sent me a gorgeous OPI polish (I’ll update with the color name once I’m at work – don’t have it in front of me), Essie’s Matte About Me (which I’ve been dying to get my hands on for the longest time but haven’t been able to find), Chanel’s Glossimer in Courtisane (which I’ve swatched for you previously – it’s gorgeous) and Nail Life Aromatherapy Speed Dry (which I know I’ll love since I loved the previous Nail Life product Nicole sent me). 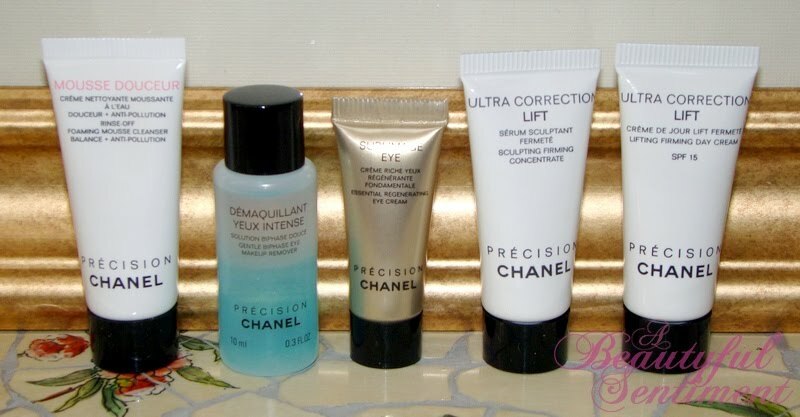 And of course I couldn’t wait to dive right into all the products! 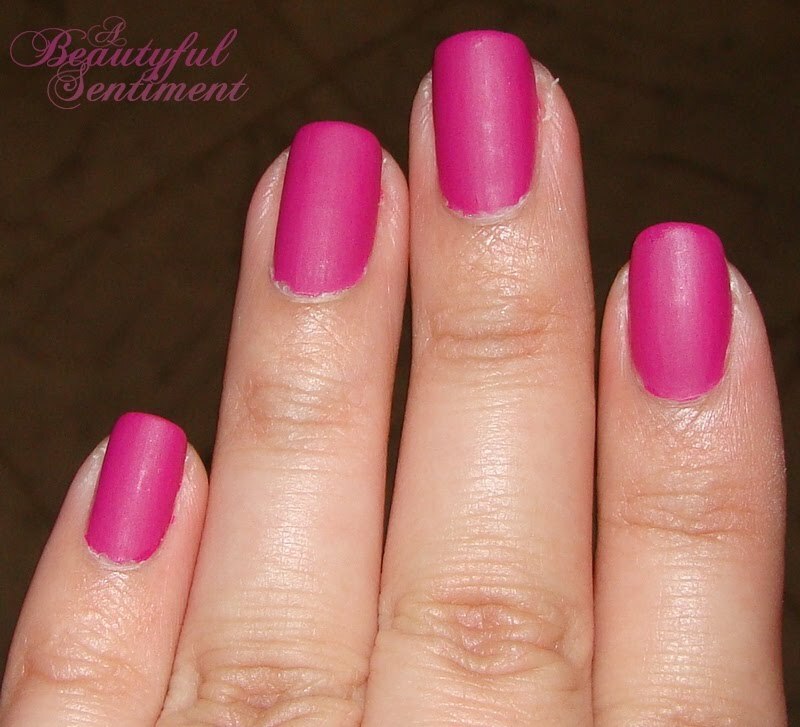 I used my new OPI polish topped with a coat of matte about you to create this really cool deep pink satiny matte manicure that I absolutely love! I can see myself getting so so much use out of Matte About You. 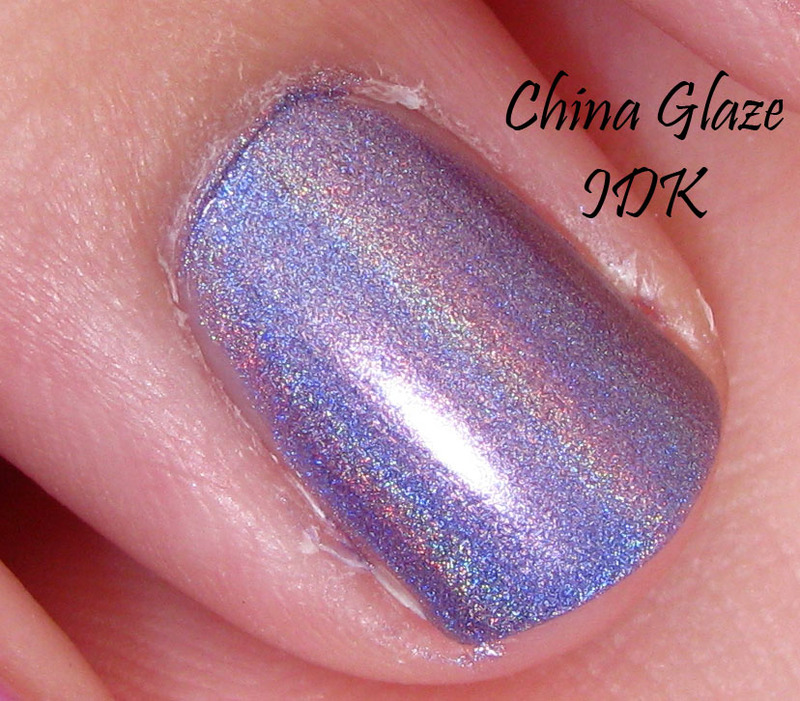 I’m thinking of trying it over Zoya Zara next – I’ve heard that it looks pretty cool over shimmer. 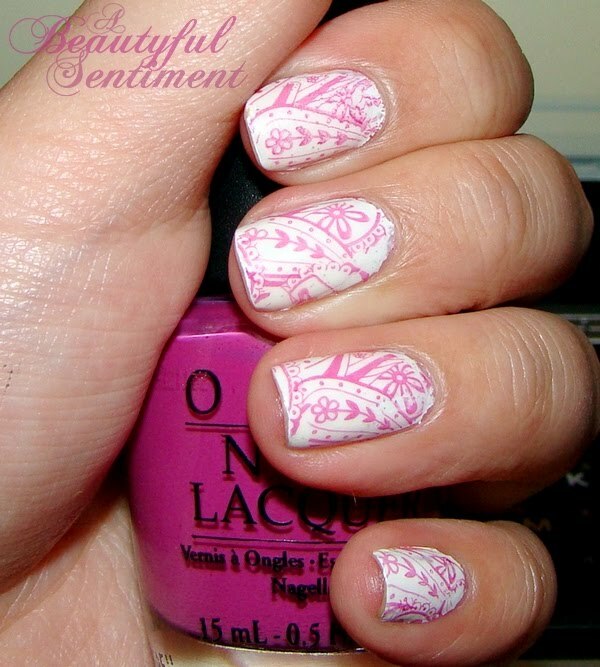 And of course I’ll be attempting a matte Konadicure at some point. I’m really curious to see how that turns out! 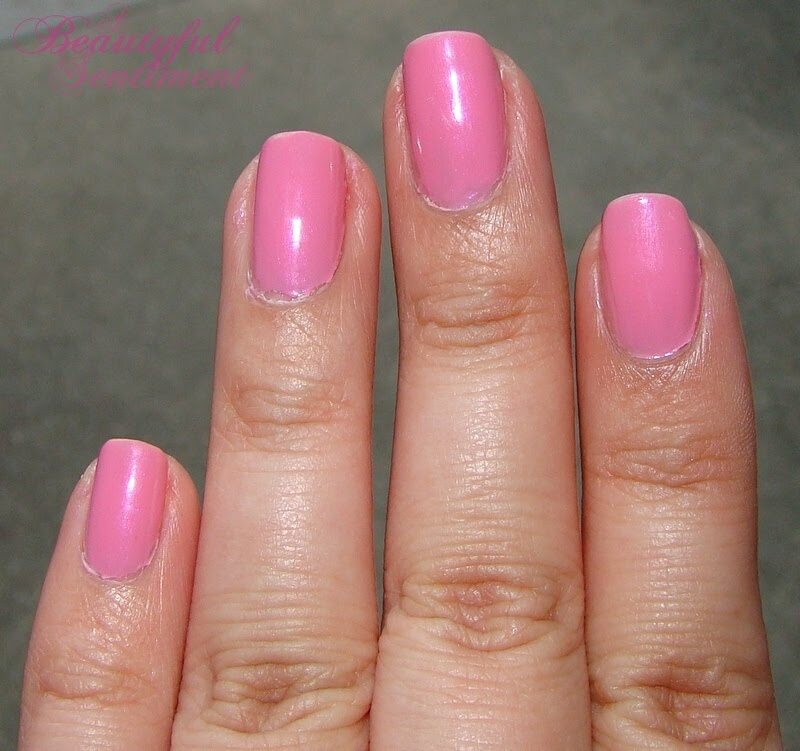 Zoya Barbie is a true Barbie/bubblegum pink that’s relatively sheer upon initial application but is buildable to an opaque finish. It’s a little too Pepto Bismol pink for me to love it the way I wanted to on my fingers, but I do think that it would make a fabulous fun pedicure shade. 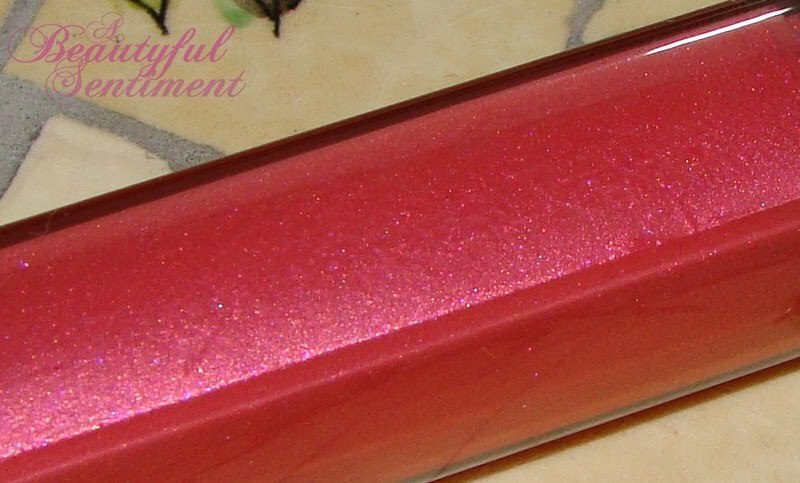 You may not have noticed as it’s very subtle, but Barbie actually has some fuchsia shimmer to it. Your best chance of seeing it is in the photo above – check out the bit of bottle right next to my middle finger. Honestly in person the only time that I’ve caught a glimpse of this shimmer has been under my office bathroom’s fluorescent lighting. Barbie is a really pretty pink, but unlike Zara and Malia it just doesn’t pull at my heartstrings. 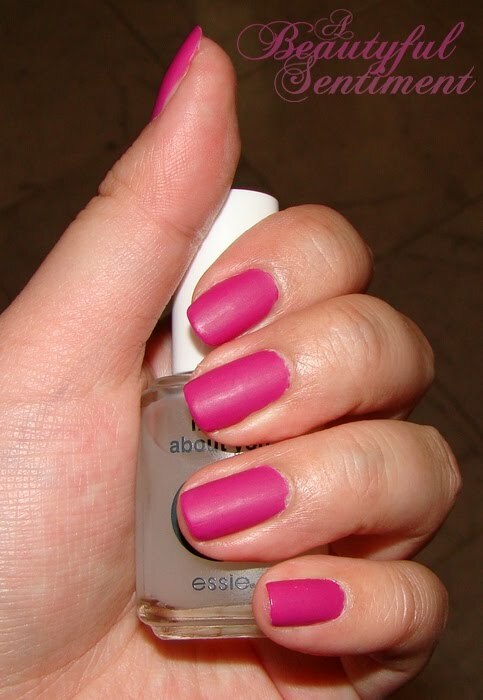 I am thinking of dong a cute contrasting manicure with a brighter hot pink over it to jazz it up a bit. What do you think? 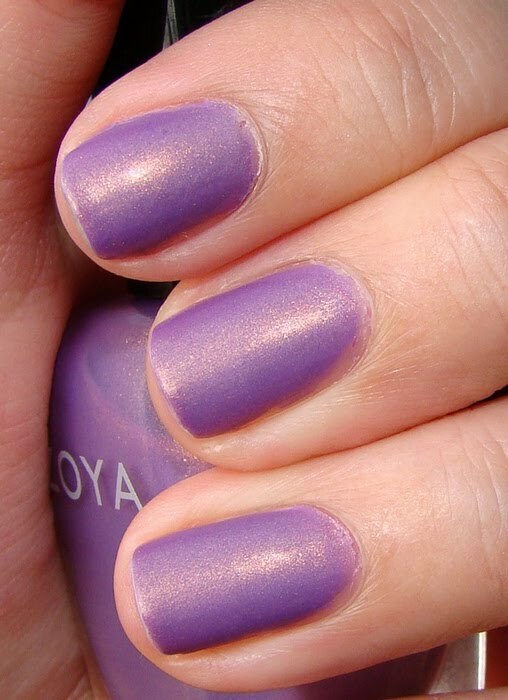 Zoya Zara is a unique duochrome metallic violet with massive amounts of gold shimmer and a foil finish. Despite all the shimmer, the finish is completely smooth. 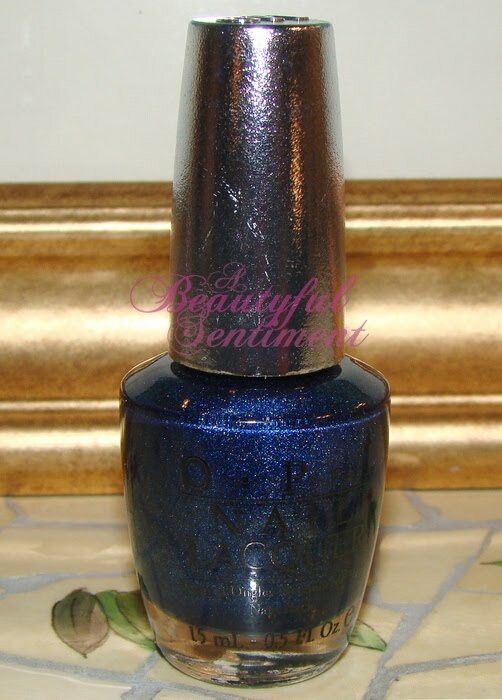 Close up of Zoya Zara in the bottle. I’ve had this particular nail polish shade on my wishlist for months, and having waited so long I think I may have hyped it up too much in my head. Don’t get me wrong, it’s seriously stunning when the sun glances off your nails just so and the golden shimmers are really brought out, but under fluorescent/artificial/dim lighting conditions, the underlying purple base just looks a litte muddy on me. Zara is also stunning as a finishing polish as a topcoat on top of your other purple polishes – it lends just the right amount of shimmer for a foiled metallic look. What shades did you get during Zoya’s three free promotion? Thank goodness this week is almost over! It’s just been one horrendous day after another, and I can’t wait to start afresh next week and to put this one behind me. On the bright side, at least my nails were cute! I used Essie’s Pure Chiffon as a base shade (it’s a really pretty champagne/peach neutral) and some random Sally Hansen polish I had over it. I’ve since moved on from this manicure (it ended up not wearing too well) and I’m currently wearing Illamasqua’s Nail Varnish in Lament (a fluorescent coral) on my nails.